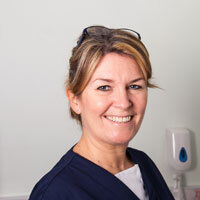 Claire joined Abbey Vets in October 2015. Claire has 3 children and 2 cocker spaniels called Henry and Flo that keep her busy at home. She also loves to ride in her spare time. Claire and her family love to visit the Lake District regularly where they can spend quality time together and walk for miles with the dogs. They have climbed Hellvellyn twice, Old Man of Coniston and Cat Bells and have many more climbs on their 'to do' list!